Today I have my DT layout for the CSI/Scrap365 Collaboration (a bit late I know but I was away :)). 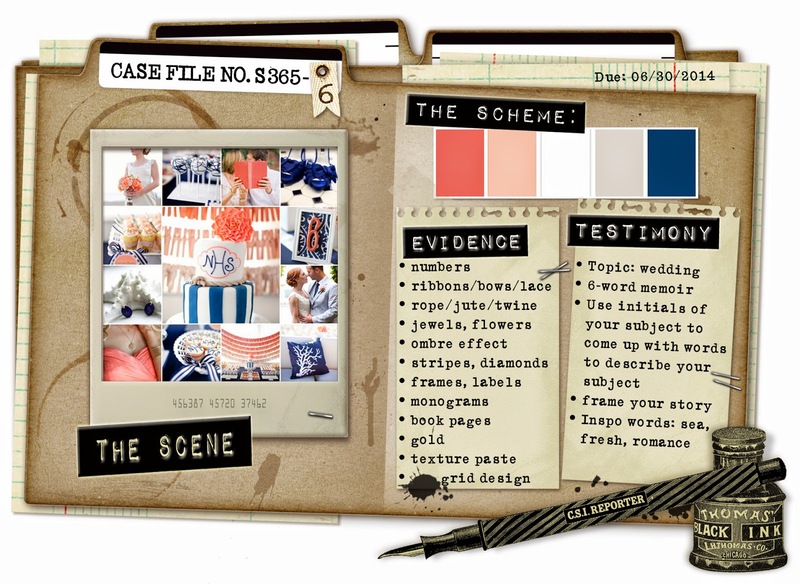 These are case files that are featured in the Scrap365 Magazine :) There is a wonderful line-up of inspiration on the site and you can see them all HERE. I love the colours of this case file. Here is how I solved the case. Scheme - the colours are all there. Evidence - numbers, jewels, flowers, ombre effect, jute/twine (on the clock), gold, texture paste. Testimony - Wedding. This has to be one of my favourite photos from Clint and Lins Wedding. They are both teary eyed and the emotion is so raw and so precious. In life we do things. Some things we wish we had never done. Some things we wish we could replay a million times. They all make us who we are and they shape every detail about us. If we were to change any of them we would not be the people we are today. So just live. Make mistakes. Make wonderful memories. But never second guess who you are, where you have been and most importantly where you are going. Love without condition and honour each other every day. Laugh when you are happy and support one another when you are sad. Guide each other when asked for direction and challenge each other to be better people. Most of all listen to one another and be ever present. Give your heart and soul and from today you will never walk alone, your hearts will be your shelter and your arms will be your home. I used two different stencils on this layout... the words from a Prima stencil and then the damask pattern. I added some gold embossing powder to the wet gesso and dried it. I also added some watercolour to the background in two shades of peach even though the lighter one looks pink here :(.. Gems were added under the damask. THe elements were fussy cut from a Prima paper which I just love and I also added a strip of punched black paper. I tucked one blue flower in to bring in the blue. I also added some lace which was coloured with a peach mist. The title was just painted black. Really lovely, Val - especially the journaling....her dress is gorgeous! And your clusters under the photo look beautiful - the touch of the dyed lace is simply MWAH!!! This layout is so beautiful.. and I got teary eyed just reading your journalling.. really special page..
What a pretty layout Val! I love the damask masking with a touch of gold!! And the pretty peachy background. Also love those Prima papers & you are layering up good girl!!! 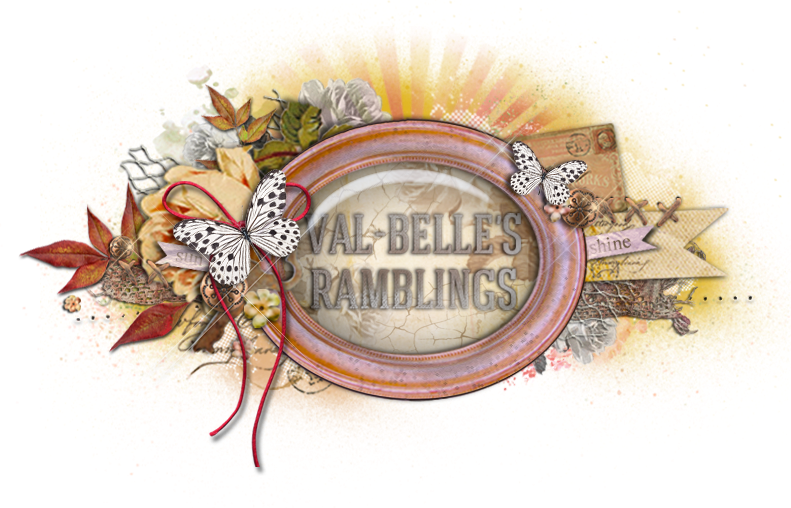 So beautiful and full of that "raw emotion" of which you speak in your journaling, Val! This is a treasure and will become a family keepsake! WOW, Val! Absolutely gorgeous! love all the little details and effort you put into this amazing creation! Love how you did the words (subtly) over the amazing background. Pinning for inspiration!! Oh this is so beautiful... and your words are even more beautiful and so heartfelt. What a beautiful and meaningful layout. And those large pics look awesome - lol! Wow this is gorgeous, Val. I love the design so much and the colours are dreamy. Absolutely perfect! beautiful, beautiful! I love that damask stencil with the gold worked in there. And truly wonderful words of wisdom in that journaling. Just an all around perfect page. Stunning page for a wonderful, remembered occasion! Love the Prima papers you used and the gorgeous, soft background! Gorgeous!